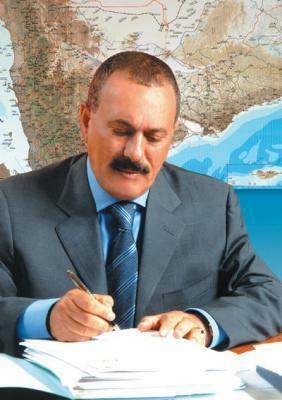 Almotamar.net, Saba - President Ali Abdullah Saleh renewed his call on Sunday to all political forces which will participate in the national comprehensive dialogue to present a civilized model of dialogue and make their discussions positive and productive through putting the country's interest above other interests. In Al-Thawra editorial, Saleh said: "It is very important that the dialogue priorities are focused on ways to produce joint visions over national issues and they serve loyalty to democratic and constitutional rights to hold the upcoming parliamentary elections on time." "Any serious dialogue aimed at serving the nation interest does not mean there will be a winner or loser. The country will win, and if there seems to be a loser, they will be enemies of the country and its unity and democracy." President Saleh also stressed continuing arrangements for holding the 2011 parliamentary elections on time, in free and transparent climate and without delay or disruption. "The dialogue should continue in a productive way to achieve its goals. It should not be a substitute, in any way, for the constitutional institutions; however, it should be a tributary for these institutions, enriching them through positive and agreeable proposals." Moreover, what will be agreed upon should be implemented with open minds and tolerance as well as with the sense of national responsibility, he urged.